I have been hooked to the outdoors since 1989, when my dad showed me VHS footage of a climb he took up Mt. Rainier. In 2002/3, I led week-long backpacking trips in Canada’s Coastal Mountains, but I typically take day or weekend trips, with the goal of doing a longer backpacking or climbing trip annually. I prefer traveling light, but a penchant for chocolate bars and a tendency to bring extra clothing puts me in the mid-weight hiking category, averaging 12 lb (5.4 kg) for day trips and 40 lb (18.1 kg) for multi-day treks. -FABRIC: Body: Dri-FIT 92% nylon/8% spandex jersey. Insets: Dri-FIT 80% polyester/20% spandex knit mesh. The shirt has an 8.5 in (21.6 cm) chest zipper, with an opaque, sturdy (but flexible) plastic zipper pull. A 1 in (2.5 cm) piece of fabric runs behind the entire length of the zipper, and a small rectangular piece even folds over the zipper’s neck opening to prevent the metal zipper from directly touching my neck. I have found this to be to be a particularly nice feature when running or hiking in cold weather. A curvy, rectangular-shaped mesh back panel runs down the middle third of the back (from between my shoulder blades to the shirt’s bottom edge) and measures approximately 18 in (45.7 cm) high by 5 in (12.7 cm) wide. According to Nike’s fit chart, size Medium shirts are recommended for women who are between 5’ 5” and 5’ 7” tall; however, I am 5’ 9” with a long torso, and I find the shirt’s length to be perfect for my frame. From underarm to bottom seam, the shirt measures 16 in (40.6 cm) in length for the front and side panels, and dips down an additional 1.5 in (3.8 cm) for the back panel, similar in shape to the back side of a cycling jersey. Likewise, the shirt’s sleeves are a great length for my long arms, measuring 24 in (61 cm) from shoulder seam to wrist seam. The circumference of the wrist seam is 7 in (17.8 cm) when laid flat, and the circumference of the neck opening is 16 in (40.6 cm) when the zipper is zipped all the way up. The shirt’s only reflective material comes in the form of a 1.25 in (3.2 cm) by 0.5 in (1.3 cm) elasticized grey reflector tab that sits just below the back neck seam and also doubles as a shirt-hanging hook. One note about sizing is that for Nike’s shirt sizing chart, the manufacturer’s website gives height and bust measurements along with the following suggestion: “If your body measurements for bust and height result in two different suggested sizes, order the size from your bust measurement.” In the height measurement, I fall under a size Large, whereas according to the bust measurement, I’d be a size Small. Despite Nike’s recommendation to go with the bust measurement, I chose a size Medium, and found it to be a great fit – snug enough to add additional layers of clothing without it feeling bulky, but loose enough to comfortably add an additional layer underneath. While this shirt is designed and marketed for runners, I have used it just as often for backpacking/trekking, cycling, climbing, and skiing because it is, simply, the most comfortable long-sleeved shirt—athletic or otherwise—that I have owned in a long time. When considering the purchase, I was immediately drawn to its softness, and even after owning it for 2+ years and putting it through who-knows-how-many washing machine cycles, it has remained pill-free and just as soft as when I purchased it. In addition to its softness, I also like its weight and thickness. I have used the shirt in temperatures ranging from 20 F (-7 C) to 90 F (32 C). Nike markets it as a “base layer”, which is what I use it for when I am skiing or hiking/climbing in cold-weather conditions. Just as frequently, however, I have used it as a warm-up layer while running (with a polypropylene or polyester tank underneath) or as a sun-protection layer while hiking or climbing in mild to warm temperatures. 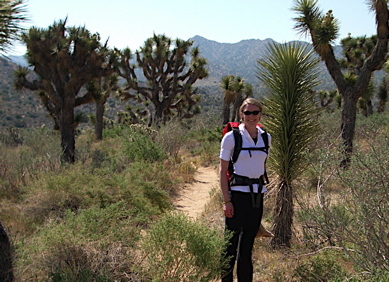 For example, during a hiking and climbing trip to Joshua Tree National Park, CA in May of 2008, when temperatures ranged from 65 F (18 C) in the shade to 80 F (27 C) in the sun, I wore the shirt as either an extra layer of warmth or an extra layer of sun protection depending on whether I was in the sun or not. This shirt scores decently in the “wicking sweat away from the body” category, and while I have owned other shirts that score higher, those other shirts also smell much worse by the end of an afternoon of hiking. 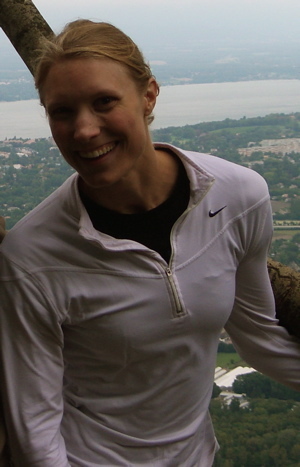 That said, when presented with a choice between my skin-tight, wick-crazy polypropylene hiking shirt and the Nike Base Layer Half-Zip Long-Sleeve Women’s Top (say that three times quickly! ), I reach for the latter every time. It also dries quickly both on the trail and at home. I don’t currently own a drier, but when I pull it out of the washing machine, it’s almost dry already. I have also noticed that it doesn’t wrinkle very easily (although, to be fair, I have been known to go out in public with clothes that are so wrinkled that I look like a walking Kleenex, so I may not be the best judge in this area!). The shirt has one reflective, rectangular patch in the back near the neck seam, and while I don’t typically need reflective material while hiking, an additional reflective patch or two would have been nice while running. This shirt is pocket-free as well, which I usually don’t notice, although occasionally I have wished that the shirt had a small pocket somewhere in which to stuff keys, money, etc. The construction of material is excellent as far as craftsmanship is concerned, and I have found no frayed hems or uncomfortable seams thus far. The Nike Base Layer Half-Zip Long-Sleeve Women’s Top is so versatile and comfortable that it is either in my backpack ready to be worn, on my body, or in my dirty hamper bin. It’s super soft, wrinkle-resistant, and light enough to wear as both a base and second layer, which makes it a great all-around athletic top.